The 2011 nissan frontier crew cab electric vehicle qualifies for a federal tax credit of up to $7,500, effectively reducing the net base price. If you’re looking for a reasonably priced midsize pickup that is as comfortable off-road as it is on a long stretch of highway, check out the 2011 Nissan Frontier. With its powerful V6 and fully boxed frame, the Frontier can tow up to 6,500 pounds. If you require the power of a V8 engine or the comfy confines of a standard regular cab, the 2011 Nissan Frontier offers neither. Changes to the 2011 Nissan Frontier include new designations and some revised option packages. The Frontier XE, SE and LE are replaced by the Frontier S, SV and SL, while the S and PRO 4X are now offered in Crew Cab form. A Vehicle Immobilizer and bed rail caps are now standard on Frontier SV, PRO-4X and SL models. Knowing that the V6 engine beneath the 2011 Nissan Frontier’s hood is a variant of the acclaimed engine found in the 370Z had us hoping for blistering performance: we didn’t get it. 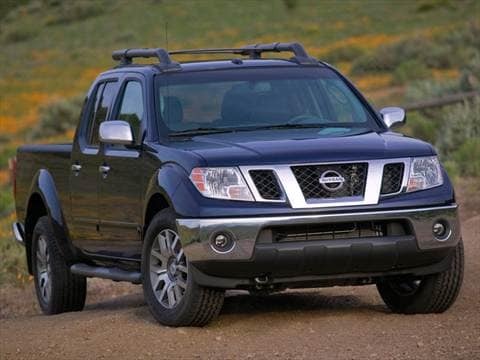 But, with 261 horsepower and 281 pound-feet of torque, the Frontier’s 4.0-liter dynamo still performed admirably. More importantly is how smooth and quiet the engine operates, as well as its fairly respectable fuel economy in highway driving. Other than the wind noise generated by the oversized side mirrors, the Frontier’s cabin is quiet and comfortable, especially for a pickup with such noteworthy capabilities. In day-to-day driving, the Frontier handles and rides as well as any sedan, although the vehicle becomes decidedly more truck-like when equipped with the PRO-4X’s larger BFGoodrich Rugged Trail tires. Part of our test drive included some serious rock-crawling, which, thanks in large part to its stiff frame and powerful engine, the Frontier negotiated effortlessly. Movable and removable cleats make it easy to transport even cumbersome cargo loads safely. Fitted atop the dash in its own protective pop-up enclosure, the Garmin Nuvi 750 navigation system cost less than $300 and is completely updatable via the Internet. Compared with much pricier built-in DVD-based systems, the Garmin option is clearly the winning choice. The 2011 Nissan Frontier’s cabin is both flexible and accommodating, with features such as dual stacked glove boxes, multiple 12-volt power points and one-liter cup holders integrated into the front doors. Leather seating is among the Frontier’s more indulgent options, as is a power glass moonroof. Crew Cab models feature traditional rear doors and a conventional back seat, while the standard King Cab model is fitted with smaller rear-hinged rear doors that provide access to flip-up rear seats. Both models offer removable storage boxes beneath the rear seats, plus an available fold-flat front passenger seat for increased interior cargo flexibility. Although the 2011 Nissan Frontier’s bulging fender flares and “angled strut” grille bear more than a passing resemblance to the full-size Nissan Titan, the Frontier’s smaller dimensions translate into a much sportier appearance. Available in King or Crew Cab, and with a short or long bed, there is a Frontier to fit almost every need. Features such as a factory spray-in bed liner help keep scuffs and dents to minimum, while available skid plates protect the Frontier’s undercarriage. Cargo of all shapes and sizes can be securely anchored, thanks to the Frontier’s available Utili-track tie-down system that offers a five-rail in-bed system with movable cargo hooks. In base S trim, the 2011 Nissan Frontier is equipped with a 2.5-liter four-cylinder engine that makes 152 horsepower and 171 pound-feet of torque, a five-speed manual transmission, four-wheel anti-lock disc brakes (ABS) with Electronic Brake force Distribution (EBD), front side-impact and full-length side-curtain airbags, and 15-inch steel wheels. Five and six-foot bed lengths are available on the Crew Cab, while the King Cab offers only a six-foot bed. Features not included at base sticker price include the 4.0-liter six-cylinder engine, five-speed automatic or six-speed manual transmission, four-wheel drive, Utili-track Bed Channel System, factory-applied spray-on bed liner, single-CD sound system, six-disc in-dash sound system with MP3 playback, air conditioning, power door locks/windows/mirrors, keyless entry, Bluetooth and a dealer-installed portable pop-up Garmin navigation unit. The PRO-4X off-road model includes the Utili-track system, an on-demand electronic locking rear differential, skid plates and Bilstein performance shocks. The PRO-4X Luxury Package adds power driver and passengers seats, heated leather front seating surfaces, a roof rack with crossbars and a power glass moonroof. The economical four-cylinder engine is offered only on the two-wheel-drive S and SV King Cab, which might become an issue if gasoline prices start to soar again. The V6 is plenty powerful and does offer the choice between a manual and automatic transmission, but all that power and performance comes at the expense of fuel economy. The 2011 Nissan Frontier King Cab Manufacturer’s Suggested Retail Price (MSRP) starts at about $19,000 for the base two-wheel-drive S model, and around $25,000 for the King Cab SV with four-wheel drive. Crew Cab models start around $23,000 and can soar to as high as $35,000 when fully loaded. A look at the Fair Purchase Price on kbb.com shows what consumers are typically paying for their Frontier trucks in your area, so be sure to check it out before you purchase. Over a five-year period, the 2011 Nissan Frontier is expected to retain a healthy portion of its original purchase price, maintaining a resale value just below the Toyota Tacoma’s projected residual values, and far higher than those of the Ford Ranger, Dodge Dakota and Chevrolet Colorado. Nissan Makes A One Tough Frontier Truck!